“If you asked an investor would they be willing to pay $2.9 trillion for a company that was going to show virtually no earnings growth in 2019, after a year when operating profit and free cash flow growth had slowed to zero by the end of 2018, investment spending began to accelerate and regulatory pressure gathered then they would probably laugh at you. But this is exactly what investors are currently being asked to do in the case of the FAANG stocks, Facebook, Amazon, Apple, Netflix and Google’s parent Alphabet,” says Russ Mould, AJ Bell Investment Director. “Analysts do expect 2019 to be just a blip, since they expect the five companies to generate aggregate net income growth of 20% in 2020 and 23% in 2021. If you take those estimates on trust, then you can have a good go at justifying the aggregate 23 times forward PE multiple for 2019 that is implied by the $2.9 trillion combined valuation and current consensus analysts’ forecasts – especially as estimates of renewed earnings growth takes the forward PE down below 20 times for 2020 and 16 times for 2021. “A PEG ratio of barely one times for 2020 (19.4 times PE divided by forecast 19.6% earnings growth) may prove tempting to both momentum and value seekers, especially as Apple, Alphabet and Facebook are returning cash to shareholders via share buyback programmes and – in the case of Apple – bumper dividends. “But the burden of proof lies with the FAANGs after what was a difficult end to 2018. Their combined market capitalisations are still teetering on ‘bear market’ territory, at around 20% below the aggregate record, and their last set of quarterly results were a mixed bag, despite the share price rallies that they prompted. “Apple warned on profits. 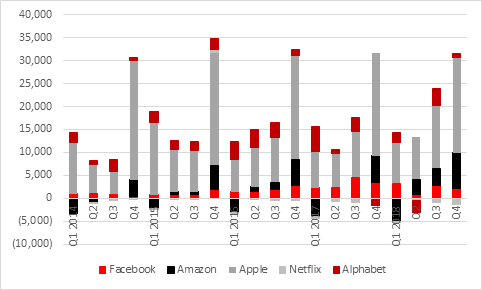 Amazon, Facebook and Alphabet all showed, and forecast further, substantial increases in investment to the detriment of near-term earnings growth and cashflow. 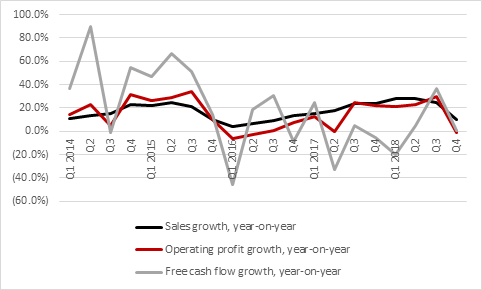 And Netflix undershot its initial subscriber addition forecasts and, again thanks to its huge investment programme, profits lurched downward from Q3 to Q4 and cash flow remained very negative. “The net result was that while their combined year-on-year sales growth figure was still 10% (to a quarterly all-time high of $218 billion), year-on-year growth in operating profits and free cash flow slowed to zero. Net income growth of 66% looks good but largely rested on the benefits of the Trump tax cuts and some financial gains booked by Alphabet, so even if the headline quantity looked good the quality was more mixed. “You can argue that the slowdown in Apple’s profits has a disproportionate effect upon the numbers for the whole group, since it dwarfs Netflix in sales, profits and cash flow on an absolute basis. “But that merely highlights the question of just how much sense it makes to bracket this quintet of companies together in the first place. They have very different operating models, vary hugely in the maturity of their target markets, have different opportunities and face different challenges in terms of competition and regulation, something which anyone buying a tracker that follows the FAANG stocks or NYSE FANG+ index should consider. “With the exception of Netflix, they do all have net cash balance sheets and the FAANGs continue to generate plenty of cash, which is definitely a source of support and comfort. Their aggregate net cashpile has reached $280 billion as they generated $72 billion in free cash flow (after capital investment and tax) last year.